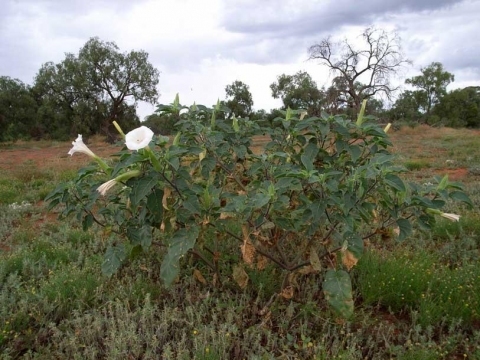 The species name is sometimes spelt Datura innoxia. Photograph by: Richardson, R.G. & F.J.
Downy thorn apple is an annual plant growing about 1 metre tall. South-western N. America to Central America. A lot of details about the history, chemistry and use of narcotic plants, including hallucinogens, stimulants, inebriants and hypnotics. A nice book to read though it is difficult to look up individual plants since the book is divided into separate sections dealing with the different medicinal uses plus a section on edible plants. Common names are used instead of botanical. ]. Any use of this plant should be with extreme caution and under the supervision of a qualified practitioner since the toxic dose is very close to the medicinal dose.